Early B cell development and commitment to the B cell lineage occurs in the foetal liver prenatally, before continuing in the bone marrow throughout life. B cells are at the centre of the adaptive humoral immune system and are responsible for mediating the production of antigen-specific immunoglobulin (Ig) directed against invasive pathogens (typically known as antibodies). The function of B cells was discovered in the 1960s by Max Cooper who demonstrated that antibody production was completely abrogated in irradiated chickens after surgical removal of the Bursa of Fabricius (the primary site of B-cell development in birds) from which the notation ‘B’ cell was derived. Several distinct B-cell subsets have been defined that possess distinct functions in both adaptive and innate humoral immune responses. Immunoglobulins consist of two identical heavy and light chains, which are joined by disulphide bonds. During B cell development, rearrangement of the Ig heavy chain occurs first, commencing with D-J recombination, which takes place in the common lymphoid progenitors (CLPs) and pre-pro B cells. This is followed by V-DJ recombination yielding a functional heavy chain protein (Ig) in large pre-B cells. The recombined heavy chain then associates with the surrogate light chains and the Ig/ dimer to form the pre-B cell receptor (pre-BCR) which is expressed on the cell surface. Signalling through the pre-BCR drives intense proliferation and differentiation into the small pre-B cell stage. Quiescent small pre-B cells then undergo V-J rearrangement of the Ig light chain, allowing the production of a complete functional BCR with a unique specificity that is expressed as IgM on the surface of immature B cells. In a bid to prevent autoreactivity, immature B cells which encounter Ag capable of cross-linking their newly expressed BCRs are eliminated by a variety of mechanisms. After production in the BM, immature surface IgM+ B cells migrate to the spleen where they differentiate through distinct transitional B cell stages termed T1 and T2, before differentiating into long-lived mature follicular (FO) or marginal zone (MZ) B cells. Thus, B cells experience both antigen-dependent and -independent phases of selection, tightly regulated through signalling events. 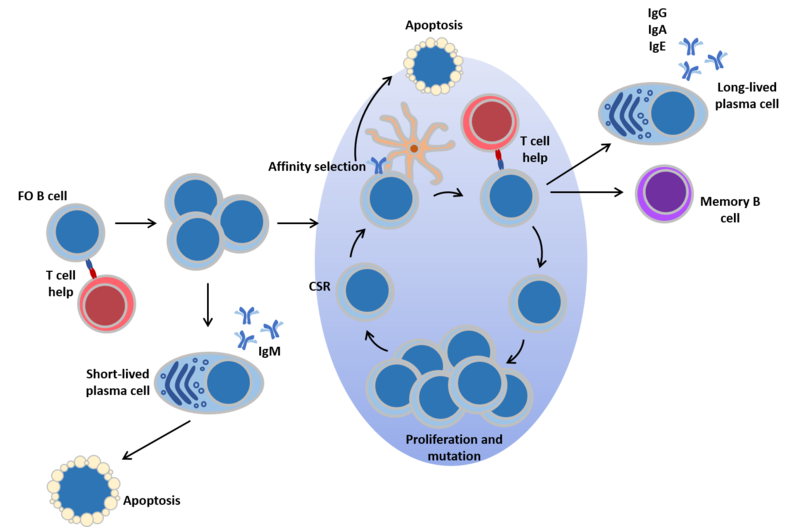 T3 B cells do not give rise to mature B cells, but instead represent a subset of anergic B cells which have been selected away from the B cell developmental pathway. In addition to FO and MZ B cells, a third population of mature B cells exists known as B1 cells. B1 cells are located in a number of tissues including the spleen, intestine, the peritoneal cavity and pleural cavities. B1 cells have distinct haematopoietic origins in the in the fetal liver, and the initial wave of lymphopoiesis in the embryo appears to be skewed towards B1 B cell development. Mature FO B cells recirculate between secondary lymphoid organs in search of antigen. Following cognate Ag encounter, B cells receiving T cell help can enter a couple of different developmental possibilities. Firstly the cells can undergo plasmacytic differentiation, form extrafollicular plasmablasts and form IgM secreting plasma cells. These cells do not have somatically mutated Ig genes and are short lived, but provide a rapid initial response to antigen. 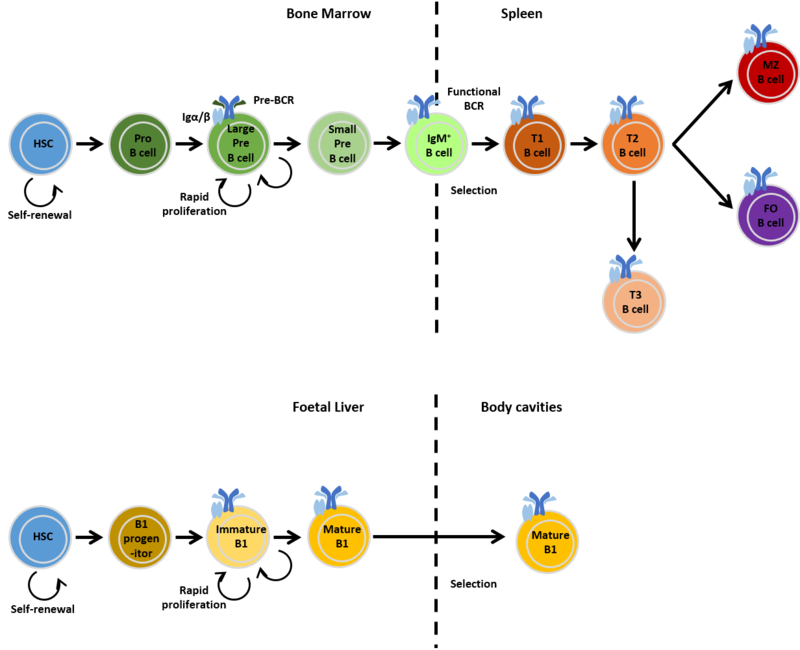 The second developmental possibility is the establishement of a germinal centre, a specialised structure within which B cells undergo rounds of proliferation accompanied by affinity maturation: an iterative process of Ig gene mutation and selection resulting in a B cell pool which can bind to Ag with the highest affinity. The cells also undergo class switch recombination. Memory B cells and plasma cells expressing somatically mutated and generally high affinity BCRs of switched isotypes exit the GC. B cells have a positive role in priming adaptive CD4+ T cells, but not CD8+ T cells. The magnitude of CD4+ T-cell responses is reduced upon pathogen challenge in B-cell deficient or -depleted mice. B cells are also able to dampen T-cell driven immune responses, giving rise to the concept of regulatory B cells (Breg). Interleukin (IL-)10-secreting B cells with suppressive functions are referred to as B10 Bregs. B10 Bregs reduce disease severity in animal models, e.g. during experimental autoimmune encephalomyelitis (EAE), the secretion of IL-10 in mice has the effect of countering this T-cell-mediated autoimmune disease of the central nervous system. Bregs secreting IL10 or transforming growth factor β(TGFβ) have been identified in other animal models of auto-immunity, cancer and infection, supporting the concept that these cells have an important role in maintaining peripheral tolerance.